The limitations of Street Art, the restrictions of categorization, and the intricacies of a frame. The previous two have been the focus of many scholarly debates and indeed of our Street Art Now series. The latter, however, gives such limitations a new context and a new meaning. This’ll Look Nice When It’s Framed, image from Artsy. Blanché’s ironically titled article, “This’ll Look Nice When It’s Framed,” offers some insight into this complex subject. Conceding that Street Art is “frame-fugitive by nature,” Blanché discusses the framing of Street Art as a “personal interpretation of a particular street piece [where] the new frame replaces the original context.”  The ability of a frame to create new context implies that a new frame results in a new work of art. For example, deities removed from a sacred alter and placed in a museum are transformed. Taken from an environment of quiet pious reflection and devotion, their new backdrop is one of academic learning and education, one of artistic reflection instead of religious intent. If an unknowing visitor came across the same deity in its original setting they would no doubt feel its aura. Yet, if the same unknowing visitor came across the deity in a museum setting they would need to read the label to understand its power. Re-framed and re-situated the work takes on a different context and is received differently by its viewers. Applied more concretely to the physical frame that surrounds an artwork, this idea aligns with what curators, collectors, and dealers have recognized over the past years as they seek to re-frame works in order to add to their value or historical accuracy. They believe that the correct frame makes a drastic difference in the effect that the piece has on its audience, “Instead of reflecting changing tastes, the approach is to match paintings with historically accurate frames, to come as close to seeing them as the artist did.”  A new frame equals a new interpretation, a new way of seeing. But as Street artists often intend for their works to exist for a shorter period of time in its original location, this sentiment is complicated when art is taken off the street and preserved. A shift in location means a shift in the dialogue that is happening between the artwork and the city, and preserving the work puts an end to any active conversation as passersby and other artists can no longer erase, add onto or comment on it. The street itself is “an accumulation of objects, and each of [these objects] has a particular potential that stems from its physical qualities and from its relation to the workings of the city and local history.”  The work has a relationship to the city and its people as it participates in conversation with them, but this dialogue is ceased when the work is stripped from the streets and this relationship becomes lost. Instead, a new frame, a new context, and a new art piece is created out of time and place. 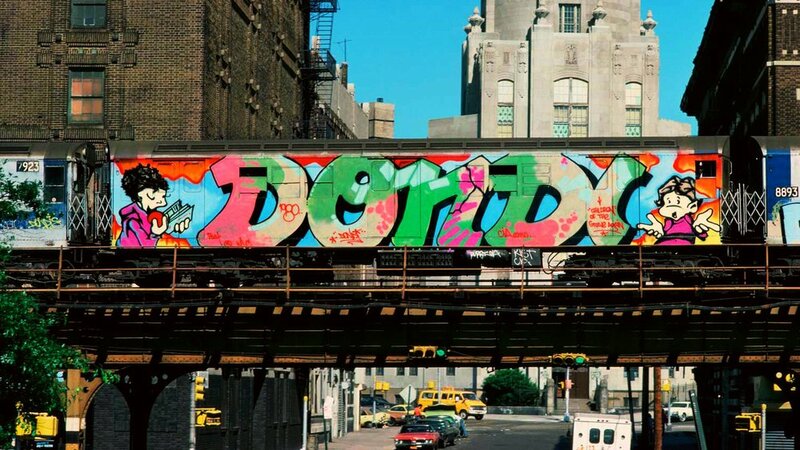 A 1983 documentary, “Style Wars,” focused on New York City’s youthful street culture, centered around break dancing and graffiti. The film chronicles the graffiti scene from the 70s to the early 80s and captures Street Art in its earliest form - bombed trains, or trains covered in graffiti writing and tags. Interestingly, the film also captures the growing gallery and commercial side of graffiti. Artists created images that appeared very similar to the ones covering subway cars but that were intentionally made for a gallery setting. This is a perfect example of how a changing frame alters the artwork itself as gallery replaces the street. Works that may have had the “same energy…same coloring, the same intensity, the same big piece that you would see on a train,” they were nonetheless on canvas with a stark contrast between where the artwork stopped and the white gallery walls began. Referring to the symbiotic relationship that should occur between Street Art and its surroundings, Javier Abarca notes that, “the final result of a street art piece is always the sum of the meaning put forward by the artist and that of the elements that were already there.”  While a city street contains many elements to work with, the blank walls of a gallery do not meet this expectation. While for some, this new frame meant value and immortality, for others it meant the end of an era. As a French visitor commented, “I think that graffiti on the subway cars were a symbol of New York for foreign people and especially French people and I think it’s a little sad if graffiti are going to be only on canvas and not anymore on trains.”  This comment brings forth another important element when considering an artwork’s frame – it’s locale. As mentioned in the previous New York Times article, a work’s frame speaks to the era of its creation. Location is inherently influential for an artist and their art, but for Street Art in particular, space and place hold a significant importance. A Street artist scouts out their location with considerable thought. Space Invader illustrates the importance of this on his website in saying, “I need to identify the neurologic points of the cities I visit…I often compare it as urban acupuncture.”  The careful thought that goes into this part of their practice is drastically altered when a work it taken off the street and, as a result, largely affects how the public reacts to and engages with the artwork. Whereas with classical art, such as a painting, a period-style frame can set the correct context and lens through which to view the artwork, Street Art is more complex because the frame cannot so easily travel with the work. Therefore, as the piece is moved the frame is changed and our “personal interpretation” of the piece changes with it. As we’ve considered the monetary and social aspects that a frame carries, the last element to consider is the physical. As Street Art first began to grace the walls of galleries, it often took on a minimalist frame, or no physical frame at all, in order to mimic the appearance of art on the street or in subway cars. In “Style Wars,” this is what we see of the pieces exhibited at the gallery. Perhaps thought of as more freeing for the work, these minimalist frames consequently emphasized the gallery’s walls as the colorful markings of graffiti end abruptly at the edge of a canvas. Martin Whatson illustrates the reverse of this in his beautiful image, Framed. Depicting a graffiti artist, it shows the inability of a physical frame to contain his work. While Street Art is limited to the streets, limited by time, by the risks and dangers that each individual artist is willing to take, “At the same time, any Street Art in frames points to the limits of these frames.”  Yet, it is through acknowledging these limitations that artists are allowed to break them; whether through Whatson’s elegantly ironic image, a sarcastic Banksy commenting on the value of his own framed work, or an electric light mural simultaneously creating and breaking a frame of dazzling color as light refuses to be contained. Evocative of our time period indeed, these artists continuously question, comment on, re-shape, and break the frames we assign them.